Paranormal investigation is a pastime spanning generations. While technology has advanced the methods in which ghost hunters operate, the desire to reach those who have passed is nothing new. Arguably, the first ghost hunter was the chaplain of King Charles II, Joseph Glanvill. Working during the late 1600s, Glanvill was obsessed with uncovering ghostly activity among the British Isles. Although paranormal investigation was evident centuries before Glanvill, through the use of mediums and psychics, it wasn’t until this man published his findings in “Saducismus Triumphatus” in 1681 that paranormal investigation was departmentalized and regarded as a legitimate operation. The popularity of ghost hunting has exploded within the past several decades. Television shows and guided tours offer the general public access to the world beyond the grave. However, what exactly is ghost hunting? Moreover, are modern methods effective at ghost identification? In a foundational sense, ghost hunting is the technique of researching history of a particular situation and seeking out the potential spirits within these regions. Traditionally, ghost hunters called upon psychics and other spiritual practitioners to guide investigations. While these spirit guides are still used today, modern ghost hunters utilize advanced infrared cameras and other equipment to locate and solidify ghostly encounters. As technology advances, so do ghost hunting techniques. Many professional and amateur ghost hunters call upon the use of infrared cameras to assist in these excursions. While infrared cameras may seem like an effective means of ghost hunting, it is important to understand the features these cameras offer and how false readings can occur. Infrared cameras capture infrared electromagnetic waves. These waves are lower than visible light waves; however, they are higher on the spectrum than microwaves and radio waves. Basically, infrared cameras allow users to view low-frequency wavelengths that allow viewers to see heat waves instead of light variations. While infrared cameras can provide accurate readings into the world beyond the living, ghost hunters must be aware of limitations. Many amateur ghost hunters believe they caught a ghostly appearance with an infrared camera. However, these images are likely the heat residue from another individual. Unlike light, heat is less transient. That is, light dissipates almost immediately when the source is removed. Heat, on the other hand, may linger for an extended period of time after the source is removed. For example, a person standing in a room may leave, but upon viewing through an infrared camera, a heat signature may still be visible. This heat signature may look mysterious to amateur investigators. However, it is nothing more than residual body heat. The same can be true if infrared cameras are used around appliances or other items that create heat. During a paranormal investigation it is imperative to turn off all heat-giving appliances and clear the room of persons for at least 45 minutes. Infrared cameras were originally produced as an anti-aircraft defense system in 1929. However, it wasn’t until 1956 that this technology was declassified and released to the public. As stated above, infrared energy is a member of the electromagnetic spectrum. It is visible through the use of specialized cameras as all objects emit some form of radiation. Cooled Infrared Detectors – A cooled infrared detector camera is typically housed in a vacuum-sealed case. This camera works by cooling the semiconductor. The cooling action allows the camera, which operated in a similar manner as a digital camera, to pick up radiation from objects. Although these cameras are quite expensive and bulky, it produces higher quality images when compared to the following camera type. Uncooled Infrared Detector – An uncooled infrared camera is the most commonly used camera among the infrared industry. Instead of utilizing a semiconductor, these cameras operate through the use of a sensor. This sensor type works by measuring the ambient temperature in a room and creating an image by comparing the ambient temperature to the infrared temperature. Although the results are accurate, the image and its resolution are lower quality than the cooled detector. As a ghost hunter, you’ll likely use this camera type. Infrared Bullet Camera – These cameras were originally designed as a form of property security. However, ghost hunters may use its technology and design to potentially capture paranormal activity. 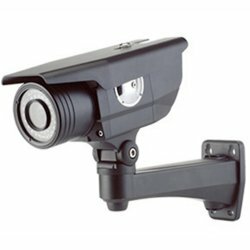 These durable cameras may be installed inside or outside as they are water and weatherproof. Due to their low cost and simplistic installation methods, ghost hunters may install these cameras in areas where ghostly activity is suspected. Due to its design, it may continually record infrared images, which are stored in a digital video recorder, or DVR. For maximum usability, purchase wireless infrared bullet cameras, which may be installed, removed and re-installed as many times as necessary without dealing with wires. 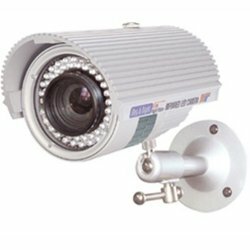 Infrared Dome Cameras – Much like the bullet cameras, infrared dome cameras are fixed cameras originally designed for security purposes. These cameras offer a wide viewing angle as the actual camera may cover a large area. Ghost hunters appreciate this infrared camera design as it allows continual scanning of a wide area. These cameras are best placed on a ceiling within a room suspected of having paranormal activity. Handheld Infrared Cameras – These camera types are the most commonly used IR cameras for ghost hunters. While the aforementioned offer continual surveillance, they’re limited by its installation requirements. Handheld IR cameras may go where the ghost hunters go. This portability is essential when investigating large rooms or multiple areas. While many digital cameras offer infrared settings, very few offer the technology and LUX rating required for paranormal investigation. Zero LUX Rating – The LUX rating of a camera determines how dark an environment can be in order for the camera to capture images. Ghost hunters must have a camera with a zero (0) LUX rating as this rating allows the camera to capture images in complete darkness. Built-in LED Lights – The best ghost hunting IR cameras are those that feature a ring of LED infrared lights around the lens. This configuration allows the cameras to accurately capture even the slightest heat signature in complete darkness. Full Spectrum Camera – These cameras are slightly different than regular digital cameras as it is designed to record light spectrums most cameras cannot. Full spectrum cameras may take video or capture still images. It is essential that you use some sort of light source with a full spectrum camera, such as LED infrared lights. Paranormal investigations provide a thrill unlike any other. However, several techniques must be used to maximize your safety and likelihood of encountering a spirit. Above all else, ghost hunting should be done with respect and professional curiosity toward those you wish to encounter. Review the Area – Always review the area in the daytime to become familiar with its terrain. Mark off potentially dangerous areas that would be difficult to navigate in the dark. Ask Permission – Many ghost hunting areas are located on private property. Never trespass on property without obtaining permission first from property owners or the local police department. Have Company and Bring Identification – As a safety precaution, never ghost hunt alone. Always bring some form of identification in case you’re questioned by property owners or police. Research Local History – The best way to determine potential “paranormal hotspots” is to research the history of a location. The library, newspapers and the Internet may be used to gather hard facts such as names and reasons for death. Clear the Area – To prevent capturing false infrared images, clear the area you wish to record of all people and heat-emitting objects. Allow the area to rest undisturbed for at least 45 minutes before starting the investigation. Be Patient – One of the most valuable skills any ghost hunter can possess is patience. You cannot force a spirit to appear. Be prepared to wait for several hours before contacting with the paranormal. Scan the Area – With your infrared camera, scan the area as slowly, but efficiently, as possible. Take note of all items you see. Becoming aware of your surroundings makes it easier to note any discrepancies during an investigation. Spirits can make their presence known by moving objects. Set Up Cameras and Leave – Ghost hunters may find success by setting up infrared cameras in various corners of a room and leaving for several hours. While this prevents a first-hand experience, the infrared cameras can record apparitions in your absence. Ouija Boards – Connecting with ghosts may not happen immediately. The use of “talking boards” may help connect with a spirit and learn about its history. Other items such as Electromagnetic Field Detectors, or EMF, work in the same manner. Ghost hunting is an exciting and memorable experience. However, this experience can be amplified through the use of infrared cameras and other electronic devices. Remember, you may not capture a ghost on your first try. Yet, with dedication and patience you’ll soon be interacting with the other side of reality.